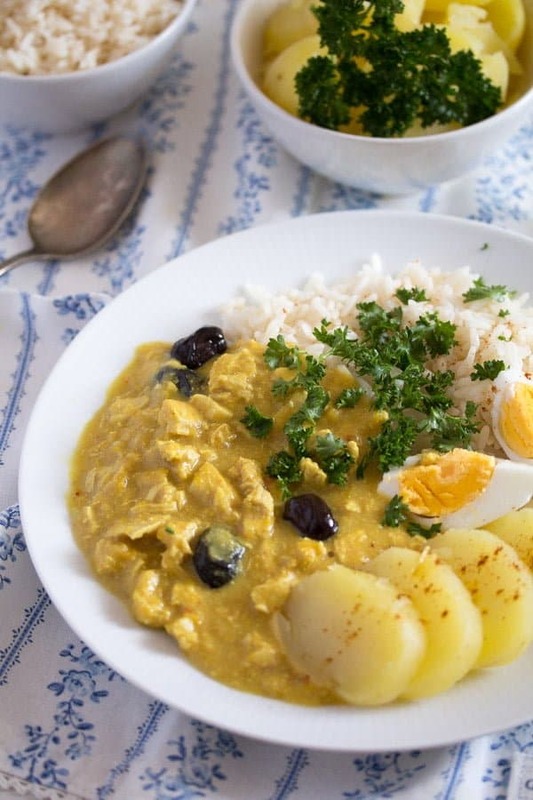 Aji de gallina – an amazing creamy Peruvian chicken stew or fricassee served with boiled eggs, olives, potatoes and rice. Many Latin American recipes on Where Is My Spoon this week. 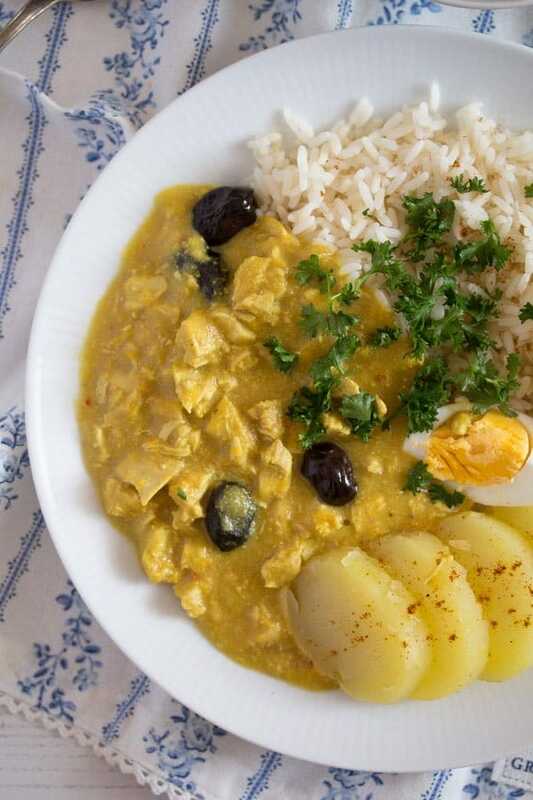 After the Mexican tostadas, the Argentinian empanadas and the Uruguayan choripan con chimichurri, now is time for a Peruvian chicken recipe, the famous Aji de Gallina. I have to confess that I found it very difficult to find suitable Peruvian and Panamanian recipes. Not because the food of these countries is not great, there were so many recipes I would have loved to cook myself, but the main difficulty is the lack of the proper ingredients here. I found many Peruvian and Panamanian recipes with yuca or plantains and so on, stuff I cannot possibly get in my corner of the world. I did cook with yuca or plantains a couple of times in my life, but it was during the time we were living in London, a place where you can find absolutely everything. So, I spent more time looking for Peruvian and Panamanian recipes than I spent looking for recipes for all the other countries I meant to cook all together. 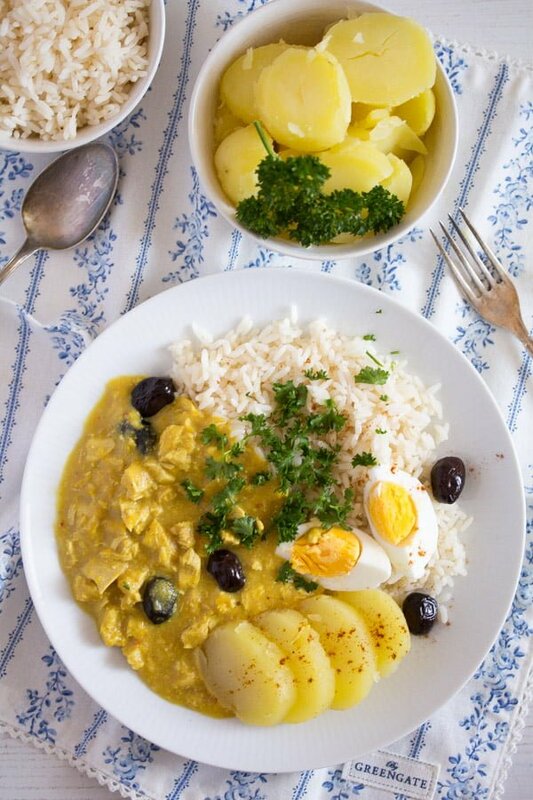 I knew about this aji de gallina, I have seen the recipe before and it was always something I knew I would like to cook. I love anything with chicken in it and then that smooth sunny sauce, the olives and the eggs on top… What is not to like? But I knew I would need aji amarillo peppers for it! Of course, impossible to get here. I looked for the aji amarillo paste and found it too expensive… And only sold in South American online stores, which meant that I could not even buy other stuff (because everything is completely unfamiliar and I would not know what to do with it) and thus not feel sorry for paying 5 euros only for the shipping. And then I remembered me scribbling down some Peruvian chicken fricassee recipe about an year ago in one of my recipe notebooks. It was a recipe found in some German magazine, which I threw away afterward, so I cannot even name it here. 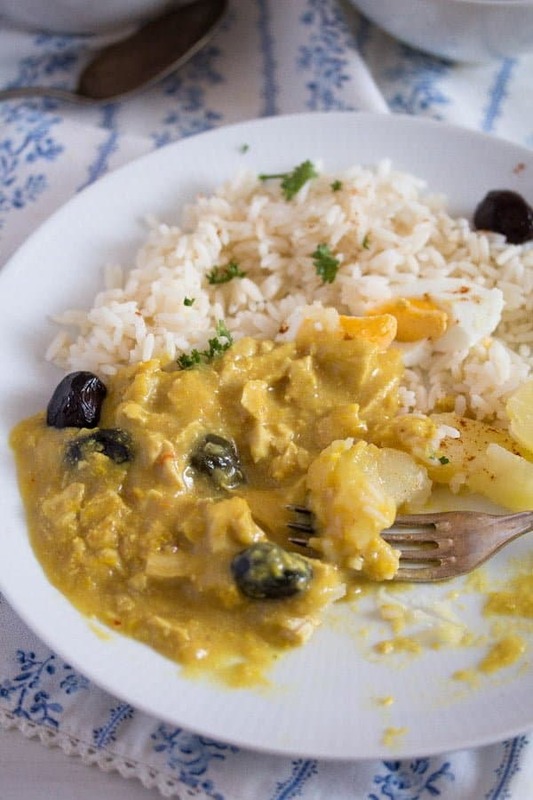 I searched for the recipe and it was indeed a aji de gallina recipe without the aji amarillo. Perfect!!! I have changed the recipe quite a bit, especially regarding the quantities and the cooking times, the cooking times never really seem to fit the reality. But the result was delicious, so good I had to make it again about a week later. Because it was delicious and because I wanted to test (and actually write down) those cooking times as well. 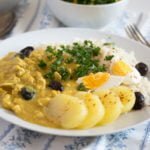 So this recipe for Peruvian Chicken Recipe – Aji de Gallina – Peruvian Food is for those of you out there, who would like to try the Peruvian aji de gallina without spending a lot on ingredients that are not available in your area. I suppose an original aji de gallina made with real aji amarillo is even better, but my version of the Peruvian chicken dish is wonderful as well. Just give it a try! First of all, you can use already cooked chicken stock and skip making the stock yourself. Cook the chicken breasts in the stock as indicated in the recipe. You will need roughly 1 liter/ 4 cups chicken stock. If making your own stock, give the roughly chopped vegetables to the cold water, add the chicken breasts. Slowly bring the water to a boil, turn the heat down and simmer uncovered for about 10-15 minutes or until the chicken is tender. It depends on the size of the chicken breasts, mine were not particularly large. Remove the chicken from the stock and set aside. Continue cooking the stock without the chicken in it. You will need some of the stock for cooking the Peruvian Chicken Recipe – Aji de Gallina. There will be some leftover chicken stock, do not throw it away. Give it to a jar and keep it in the fridge for several days. Or give it to a freezer container and freeze it for up to 3 months. You can use the leftover chicken stock for adding to a soup, for making stews or sauces. When the chicken is cool enough to handle, tear it into small pieces and set aside. The bell yellow peppers will substitute the aji amarillos. Together with the chili, as the aji amarillos are hot, while regular bell peppers are not. My chili was very hot this time, so I have only used one. I also thought about the children eating, so I did not want to overdo it with the heat. The dish was spicy, but mild enough for the children as well. So, adjust the heat of the dish as desired. You can add more chilies or leave their seeds inside to make the dish hotter. I always use black wrinkly olives that still have their pit inside, similar to these ones Auzoud Oil-Cured Black Olives, Whole, Supports North African Women Farmers, 100% Natural, Hand-Picked, 4.4 lb.
. Pitted olives make no sense for me, as they taste pretty much of nothing. But do use what you like. If you chose to use whole olives with pit inside, warn the other people at the table about the pits, people don’t always expect them. Typically with hard boiled eggs, boiled potatoes and rice. A feast for my husband, I am telling you. 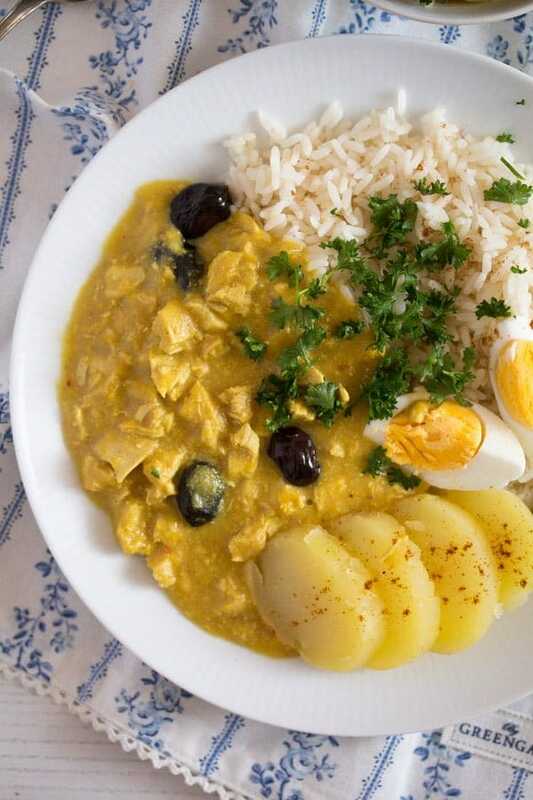 Chicken fricassee and hard boiled eggs with sauce are two of his favorite dishes and this aji de gallina is almost a South American version of a chicken fricassee with eggs in it. He could not stop eating this! Start cooking the eggs, potatoes and rice while the rest of the dish is cooking, so that you have everything ready in time. If you don’t have enough place on your hob with all the different pots and pans, you could cook the potatoes and the eggs together. Either give the eggs to the pot when the water cooks and think about taking them out after 8 or 10 minutes or add them to the potatoes during the last 8-10 minutes of the cooking time. The Peruvian Chicken Recipe – Aji de Gallina can be easily reheated. If I have leftover rice and potatoes (sliced) as well, I add them to the sauce and reheat everything together. You might want to add a small amount of chicken stock or water when you reheat the sauce together with the rice and/or potatoes. Roughly chop the carrots, leek, celery or celeriac. Give them to a pot together with 2 of the garlic cloves and the whole chicken breasts. Cover with the water, bring to a boil, turn the heat down and simmer uncovered for 10 minutes. Remove the chicken breasts from the pot and set aside. Continue cooking the stock (uncovered) while you prepare the rest. You will need some of the stock for the recipe. Remove the seeds from the yellow bell peppers and quarter them. Give them to another pot, cover with water, bring to a boil, turn the heat down and cook for about 10 - 15 minutes or until soft. Drain well. Give the peppers back to the pot, add about 60 ml/ ¼ cup from the cooking chicken stock and the remaining 2 garlic cloves. Puree until smooth. Give the torn toast slices and the walnuts to a bowl. Add 60 ml/ ¼ cup of the cooking chicken broth. Puree the toast and the walnuts to obtain a thick paste. Chop the onion and the chili finely. Heat the oil in a Dutch oven or another heavy-bottomed pot and cook the onion until translucent. Add the chili, the bell pepper sauce and ¼ cup of the chicken broth. Turn the heat down to low and simmer for about 15 minutes or until slightly thickened. Add the walnut mixture. Stir well and simmer for 5 minutes more. If the sauce is not smooth enough at this point you can blend it again. In the meantime shred the cooked chicken breasts. Give them to the pot together with the olives. Add the milk, turn the heat a bit up and continue cooking for several minutes or until the sauce is thickened to your liking. Adjust the taste with salt and pepper. Be generous. 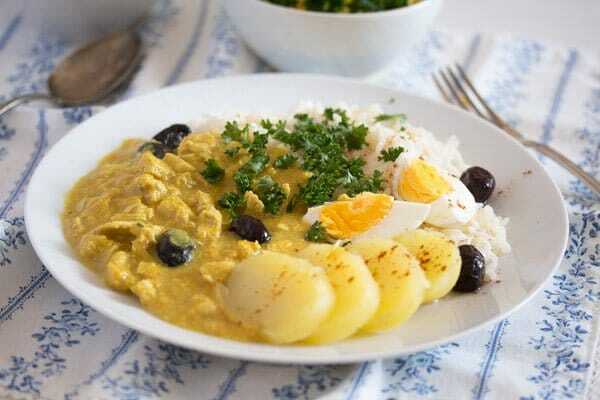 Serve with the hard boiled eggs, cooked rice and boiled potatoes. Strain the remaining chicken stock and use it for soups, stews or sauces. The chicken stock will keep in the fridge for several day or it can be frozen for later use. 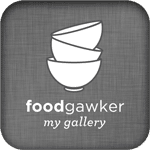 Peruvian Chicken Recipe – Aji de Gallina can be easily reheated. If you have leftover rice and potatoes (sliced) as well, add them to the sauce and reheat everything together. You might want to add a small amount of chicken stock or water when you reheat the sauce together with the rice and/or potatoes. You can use already cooked chicken stock and skip making the stock yourself. Cook the chicken breasts in the stock as indicated in the recipe. You will need roughly 1 liter/ 4 cups chicken stock. It looks filling and delicious! I adore that sauce. Sounds delicious! I have recently started to cook with Mexican dried chillies and found all I needed on UK Amazon (I also buy there powdered chilli for Indian cuisine, dried Thai chillies… I can get all the ingredients in many “exotic” food shops, but they are much more expensive or/and the quality is lower). This looks really, really good! I love aji peppers. Sissi at Withaglass turned me onto them. I’ve only used them once and loved the flavor. I can imagine how wonderful the flavor goes with chicken and your other ingredients. Pinned!